Willow stand density. Photo: SUNY-ESF. A portion of the land area in commercial willow bioenergy fields must be left unplanted for headlands to facilitate efficient machinery operation. Other unplanted areas, if not functional, should be minimized through best-practice targets in order to maximize biomass production and revenues. An important consideration for commercial shrub willow crop production for bioenergy is the percentage of land area on which the crop is produced (aka, the planted area) relative to the total land area on which taxes or rent is paid. Land costs can be 15% or more of the total life cycle costs of a willow planting over 20+ years,1 so maximizing the planted area and resulting biomass production in a field or parcel (group of fields) is an important factor in making willow bioenergy plantings as profitable as possible. However, a certain amount of land must be intentionally kept out of production for headlands (unplanted areas around the edge of a crop field) to accommodate the efficient turning of machinery. Headlands for most willow operations, especially those using a forage harvester system, should be about 30 feet wide on two ends of the willow rows to provide adequate space for turning farm machinery during planting and harvesting. Narrower headlands can reduce the efficiency of operations by increasing the turn time of machinery, causing flat tires on vehicles from driving over cut willow stumps, and creating other safety hazards or damage to machinery when operating in close proximity to standing willow and obstacles near the field edge. Figure 1. Harvester cane wagon. 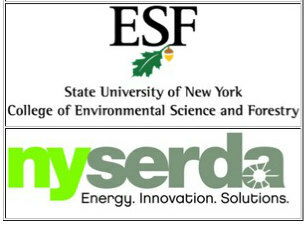 Photo: SUNY-ESF. The summation of all unplanted areas in a field or parcel can equate to substantial acreages on which taxes/rent are paid but biomass is not produced. 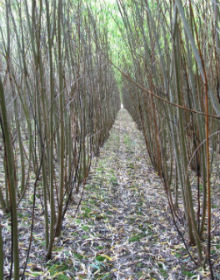 Thus, best-practice targets for willow bioenergy crops should aim to maximize planted area by minimizing unnecessary and avoidable unplanted areas. However, some area in each field will always be left unplanted for headlands and other uses. 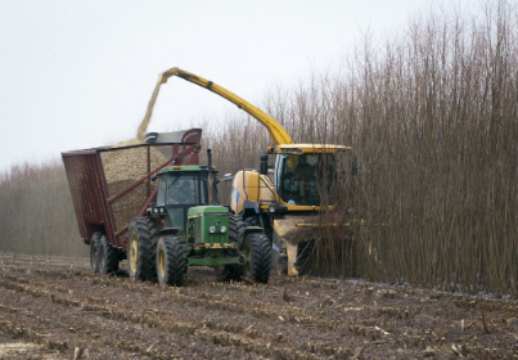 It may be possible to find other value-added uses for unplanted areas, such as intercropping, but it is assumed that maximizing willow biomass production is the primary objective. The purpose of this research was to evaluate the level of unplanted area in commercial willow fields and discuss the results in the context of best-practice targets for maximizing planted area, thereby increasing biomass production and profitability. A 2014 study conducted by SUNY-ESF and NEWBio investigated the percentage of planted and unplanted areas in commercial willow fields in northern New York State. The study sampled 36 individual fields within 11 parcels, totaling 1,113 acres. 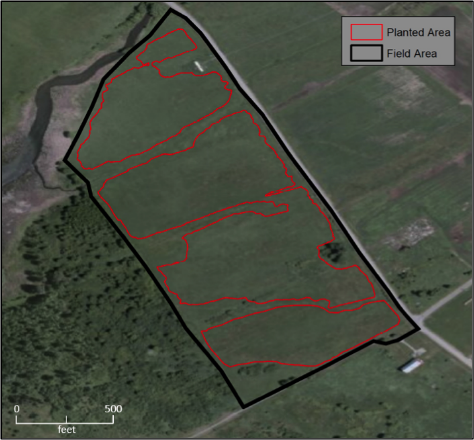 The potentially tillable acreage under lease/tax of each field was compared to the areas with established willow. Age of the willow ranged from two to eight years after planting, with stems in either the first or second harvest rotation. Tillable acreage boundaries were acquired from a previous study by the United States Department of Agriculture Natural Resources Conservation Service (USDA NRCS, unpublished data) conducted when administering a regional Biomass Crop Assistance Program (BCAP) in 2012. The willow planted area was determined by SUNY-ESF by walking the outer edge of the willow crops within each field and charting the crop boundary with a handheld GPS unit (Trimble GeoXM). The total field area (potentially tillable acreage) was then compared to the planted area, using ArcGIS 10 for this analysis (Figure 2. Example of a planted-area analysis in a parcel of commercial willow fields in New York State. The total field area or potentially tillable acreage (in black) of this parcel is 41 acres, whereas the total area planted with willow (in red) is 30 acres. This means that, of the potentially tillable acreage on which rent/taxes is being paid, 28% is unplanted, either for headlands, un-cleared obstructions, failed establishment, or other reasons.). Figure 2. Example of a planted-area analysis in a parcel of commercial willow fields in New York State. Photo: SUNY-ESF. The amount of unplanted area in individual fields ranged from 4% to 43%, with a mean of 21% and standard deviation of 10%. Unplanted area at the parcel level ranged from 14% to 31%, with a mean of 21% and standard deviation of 6%. This percentage of unplanted area is higher than previously anticipated from research-scale willow plantings, which did not fully account for the miscellaneous unplanted areas and other complexities of commercial-scale fields. This level of unplanted area is higher than desirable for commercial willow grown under best-practice targets that aim to maximize biomass production per unit land area. 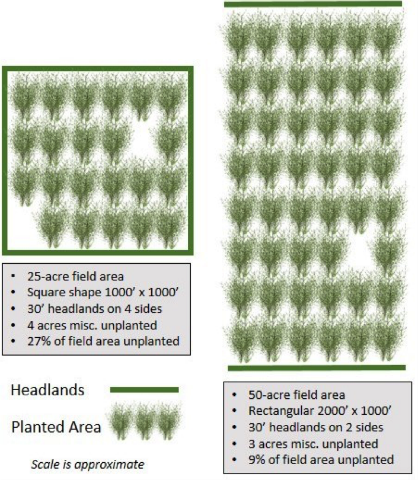 For an individual field, the amount of unplanted area is a factor of several variables including field size and geometry, headland width, the number of sides of the field with headlands, and the amount of area left unplanted for miscellaneous reasons other than headlands. Larger, rectangular-shaped fields that create longer rows for continuous runs of machinery are more efficient than smaller, square, or irregularly shaped fields. Limiting headlands to 30-foot width (or slightly larger) creates sufficient turning space but not excessive unplanted area. Turning, and therefore 30-foot headlands, is generally only required on two ends of the willow field (assuming all the willow rows planted are in the same direction), so restricting headlands to two sides of the field (with the option for narrower access roads on the other two sides of the field) can also reduce unnecessary unplanted area. For example, a 25-acre, square-shaped field, approximately 1,000 feet by 1,000 feet, with 30-foot headlands on four sides of the field, and four acres left unplanted for miscellaneous reasons, would leave 27% of the total field area unplanted (Figure 3. Two hypothetical willow plantings show that larger fields, longer rows, and minimizing miscellaneous unplanted areas can help to meet best practice targets of less than 10% of the total field area left unplanted while also maintaining adequate headlands. This increases the biomass production per unit land area on which taxes or lease are paid. ), which is much higher than desirable. If the field in this example is scaled up to a roughly 50-acre rectangle, 2,000 feet by 1000 feet, with 30-foot headlands on only the required two ends of the willow rows, 10-foot-wide access roads on the other two sides of the field (equaling one acre of land area), and the miscellaneous unplanted area limited to two acres, the percentage of unplanted area is reduced to about 9%. Assuming best-practice targets could reduce headlands from approximately 20% to 10% on an average 50-acre field like this example, at modest yield assumptions of 8 green tons per year, the result of these best practices would net the grower an additional 120 green tons of biomass and the associated revenue every three-year harvest cycle. The upfront cost of site improvements and other practices to increase planted area should be considered in the context of the projected life cycle of the planting. The EcoWillow tool for financial analysis of willow bionergy crops can assist in evaluating these scenarios (visit www.esf.edu/willow and follow the link for EcoWillow). Figure 3. Two hypothetical willow plantings.Photo: SUNY-ESF. Numerous, seemingly small areas left unplanted for various reasons across a large field or parcel might appear negligible during site assessment and planting, but these areas can quickly add up and substantially lower planted area, biomass yield, and revenues can result. A suggested best-practice target for commercial willow is to have unplanted area be less than 10% of total field area on which rent or taxes is paid while also maintaining adequate headlands and other functional unplanted areas. Attention to potential problem areas during the site-assessment-and-selection phase can help to reduce the occurrence of unplanted areas later on in the site-preparation-and-planting phases. Site improvements, soil modifications, careful consideration of planting design, GPS-guided planting, interplanting, and replanting can also help to minimize unplanted areas and maximize biomass production over the life cycle of the planting. Additional information on willow site assessment, site preparation, and related topics is available from the Willow Project at SUNY-ESF (www.esf.edu/willow). This work has been supported by the New York State Energy Research and Development Authority (NYSERDA) and the US Department of Agriculture National Institute of Food and Agriculture (USDA NIFA) through the Northeast Woody/Warm-Season Biomass Consortium (NEWBio). 1Heavey JP and Volk TA, 2014. Willow Crop Production Scenarios Using EcoWillow 2.0. Shrub Willow Fact Sheet Series. The Research Foundation for the State University of New York College of Environmental Science and Forestry.